One of the more aggravating things found in many high performance engines is constantly having to re-adjust rocker arms. Until ARP introduced the patented Perma-Loc adjuster, there wasn’t a “poly lock” on the market that you didn’t have to continually tighten. There are several important reasons why ARP’s exclusive Perma-Loc rocker arm adjusters won’t loosen like others. First, the adjuster body is heat-treated all the way through (not just case hardened). This eliminates the thread “movement” common to others. Secondly, the threads are machined exactly perpendicular to the bottom of the adjuster, so it seats evenly and applies pressure on a full 360˚ circle. Lastly, the set screw is machined flush on the bottom (not pointed) so it will have optimum contact on the rocker arm stud. You’ll find ARP Perma-Loc’s easy to use, too. The compact 12-point head is designed to hold your wrench in position while you lock the set screw with an Allen wrench. 12-point head with special shouldered “stop” to hold wrench. 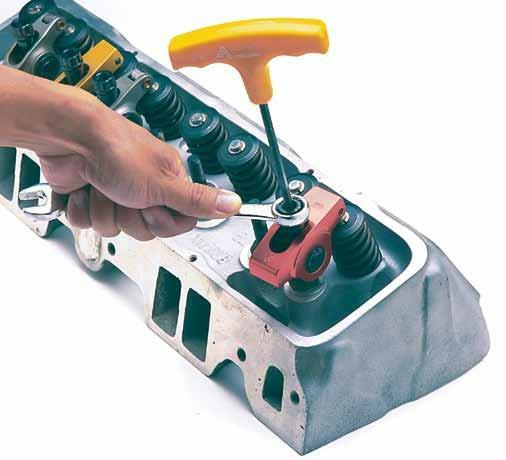 Eliminates need for special adjusting tools. Forged in-house from 8740 alloy chrome moly steel and heat- treated throughout (not simply case hardened, as others are). Bottom flush-ground perpendicular to threads. Threads are precision CNC-machined exactly perpendicular to the bottom of adjuster to ensure an optimum seat and even pressure. 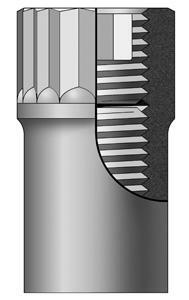 Set screw has flush-machined tip for optimum contact and seating on stud. Threads machined for maximum engagement.